Red Mountain is said to have been formed at the time of the Convention, when Lorkhan's heart was removed and thrown into the sea; Red Mountain formed where the Heart of Lorkhan landed. Long after, the Dwemer established themselves in Morrowind, and Red Mountain became a fortress at the heart of the Dwemer kingdom of Vvardenfell. The Dwemer eventually united with the Chimer to expel the Nords from Morrowind in 1E 416. The two elven races coexisted peacefully under the banner of the kingdom of Resdayn for a time, until the Chimer general Indoril Nerevar learned that the Dwemer had found the Heart of Lorkhan and sought to use it to empower the Numidium. This led to the War of the First Council, which culminated in the Battle of Red Mountain. Coinciding with the war, Red Mountain erupted in 1E 668, reshaping the island of Vvardenfell and blotting out the sun for a full year. This event became known as the Sun's Death. Long restive, Red Mountain awoke again briefly in 2E 583, an apparent consequence of Vivec's power being siphoned away. The culprit behind the Warrior-Poet's debilitating affliction was the Daedric Prince Clavicus Vile, who needed Tribunal power to find and enter Sotha Sil's Clockwork City. This resulted in Vivec being severely weakened, to the point that Baar Dau threatened to fall and Red Mountain erupted, endangering Vvardenfell. Fortunately, Vivec's powers were restored through the actions of an Outlander and disaster was averted. Between 3E 400 and 3E 417, the Tribunal erected the Ghostfence around Red Mountain to contain the spread of the Blight and the Corprus monsters. 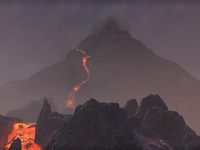 In 4E 5, recorded by the Dunmer as the Red Year, Red Mountain erupted shortly after Baar Dau, since converted into the Ministry of Truth, completed its descent and impacted into Vivec City. The eruption produced massive amounts of smoke and toxic ash that smothered much of Morrowind and left Vvardenfell almost entirely uninhabitable. 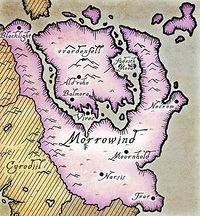 The portions of Morrowind that survived the initial calamity were not spared for long, as ash from the continually-erupting mountain poisoned the land and sea over the following decades. While not accessible, Red Mountain is clearly visible from Solstheim in the Dragonborn expansion for TES V: Skyrim, from Stonefalls in Elder Scrolls Online, and throughout Vvardenfell in Elder Scrolls Online: Morrowind.